Next Wednesday 30th January, at Kings College London, OneVoice will host an event to examine the legacy of President Shimon Peres, and the wider question of leadership in the region. Together with Kings College War Studies Society, the event will examine the legacy of President Shimon Peres and the wider question of leadership in the region with a Q&A after the screening. We do hope you’ll be able to join us at Kings College for this event, and the subsequent screening next month of the second film examining the life and political legacy of Yasser Arafat. OneVoice is an international mainstream grassroots movement that aims to amplify the voice of Israeli and Palestinian moderates, empowering them to seize back the agenda for conflict resolution and demand that their leaders achieve a two-state solution. “Raise Your Banners” reply to the call to cancel the appearance of Gilad Atzmon at their festival. Raise You Banners have issued a statement on the call to cancel the appearance of antisemite Gilad Atzmon at their festival.Their response shows that they first received complaints about Atzmon’s appearance over 6 months ago. Their response in April is below their current response. With less than a week to go, Raise Your Banners 2011 organisers are gearing up to a very busy festival. In the past seven days we have had further expressions of concern about our inclusion of Gilad Atzmon to headline one of our seven concerts. Two blogs condemned the festival and its funders for hosting him because they accused Gilad Atzmon of anti-Semitism and holocaust-denial. These recent claims followed publicity in two blogs on November 12th, and were followed on November 17th by a critical news item in the Jewish Chronicle. We have had eight expressions of concern, some asking us to rescind the invitation to Gilad Atzmon. To do so at this stage would have very bad financial implications for the festival now and in the future. The committee already considered similar concerns in April, decided to continue its invitation to Gilad Atzmon, and issued a statement then. That statement is reproduced below. Gilad Atzmon’s philosophical and political writings stir up keen arguments about identity politics within the socialist movement, as well as a strong reaction from their main target the Israeli government. As we explained in our earlier statement in April, we do not believe the claims of anti-Semitism are justified. All artists have signed contracts to adhere to our equal opportunities policy in which abusive or discriminatory behaviour or language are unacceptable and will not be tolerated. We are sure that our audience would not tolerate any such behaviour. Raise your Banners 2011 enjoys a broad range of contributions. At its Jazz night Israeli Gilad Atzmon is joined by Palestinian Nizar al Issa, UK singer Sarah Gillespie as well as the Orient House Ensemble. We had hoped that Cuban Omar Puente would also be present. In our film room we are showing Holocaust: a music memorial from Auschwitz. John Hamilton will be leading a workshop Songs to Counter the Zionist Bullies with Strawberry Thieves choir. We did not accept Gilad’s offer to present a workshop of his philosophical writing. Raise Your Banners is an internationalist celebration of the power of music and song. We hope to see you there. Raise your Banners 2011 is proud to present its festival of political song in Bradford once more. It is sixteen years since Sheffield Socialist Choir organised the first Raise your Banners in celebration of the great Wobblie union organiser and songster Joe Hill. Raise your Banners unites political choirs with soloists and bands, to celebrate committed and campaigning music that constantly renews the vision of equality for all the world’s peoples. Raise your Banners is music to celebrate ordinary people joining together to struggle for something they want, whether it is local childcare or opposition to the ravages of global capitalism. We seek the best artists who will celebrate popular struggles in their music and song, and aim for all to have a rollicking good time. RyB 2011 is developing apace. For the Friday night we have planned two big events in parallel: a folk concert with John Tams, Barry Coope and Roy Bailey, and a jazz concert with Gilad Atzmon, Omar Puente, Nizar al Issar, and Sarah Gillespie. We have had opposition to our invitation to Gilad Atzmon to play, and requests that Raise your Banners revoke this invitation on the basis that Gilad Atzmon’s political and philosophical statements have been anti-semitic and have denied the murder of millions in Nazi concentration camps. Gilad Atzmon rejects this interpretation of his writings. The request has come principally from the Jewish Socialists’ Group and some individual supporters of Raise your Banners festival. We have discussed the matter with the Palestine Solidarity Campaign and are satisfied that PSC have no boycott of Gilad Atzmon or events that he is involved in. The organising committee have discussed this matter in detail, following distribution of the material sent by those objecting to Gilad Atzmon’s invitation to the festival, and a summary of the statements by Gilad Atzmon, with links provided so that people could make their own minds up. A full discussion as held at which all members of the organising committee were able to give their opinions and then respond to those made by others. A vote by members of the organising committee was inconclusive so the directors, as those with ultimate responsibility for the festival, then voted to continue with the invitation to Gilad Atzmon, with the provision that all performers’ contracts include adherence to RyB’s equal opportunities policies. Raise your Banners festival directors are not arbiters of political disputes between those who consider themselves part of the progressive movements with which the festival identifies. We trust that all our supporters and all our performers will work to make the festival a musical celebration of struggles for equality and against discrimination of the poor and oppressed. Update: Bob From Brockley has his say here. Political music festival featuring antisemite Gilad Atzmon sponsored by the Art’s Council, The Co-Operative and National Lottery Fund. Raise Your Banners is a “festival of political song” held annually in Bradford and is sponsored by the Art’s Council, The Co-Operative and National Lottery Fund. It was started 16 years ago in celebration of the great Wobblie (IWW) union organiser and songster Joe Hill. However this year it’s featuring Gilad Atzmon. Maybe the organisers don’t know about Atzmon’s politics but seeing that they link to his website, maybe they do. As it’s a festival of poliitical music they can’t use the old argument that they’re hosting Atzmon for his music and not his politics. You may have liked to have gone to see Peggy Seeger perform but unfortunately it’s sold out. Still you can always go to the workshop “Songs to Counter the Zionist Bullies”. Conway Hall, 25 Red Lion Square, Holborn, London WC1R 4RL. 9/11, alien visitation, Jewish cabals and global warming – why are people drawn to conspiracy theories, and what holds them captive? What are the warning signs of a dodgy conspiracy theory? What conspiracy theories are actually credible, and why? Spend an entertaining and informative day with some if the world’s leading experts. Venue: Conway Hall, 25 Red Lion Square, Holborn, London WC1R 4RL. Cost £10, £5 to students. Booking in advance available at the BHA website. Remaining tickets will be for sale on the door. Organized by Stephen Law, Provost CFI UK. Media can contact Stephen on think@royalinstitutephilosophy.org. 10.45-11.55 Chris French and Robert Brotherton, “Conspiracy Minded: The Psychology of Belief in Conspiracy Theories” This talk will introduce the topic of conspiracy theories and outline the difficulties that arise when trying to formulate a universally acceptable definition of this deceptively complex concept. Conspiracy theories have come to play a prominent role in contemporary culture. It is almost inevitable that any significant event will become the subject of conspiracy theorising, and considerable numbers of people endorse such theories. Although the psychology behind belief in unsubstantiated and implausible conspiracy theories is not yet well understood, social scientists are now beginning to address this important topic. A summary of theories and empirical findings to date will be presented. 12.00-1.10 Karen Douglas, “A social psychological perspective on conspiracy theories”. Karen will give some background on the psychological correlates of conspiracy theories (e.g., personality characteristics, motivations) before going on to discuss some of her own and her students’ research. She will talk about research showing that conspiracy theories are persuasive and change people’s opinions about what happened in major world events such as the death of Princess Diana. Karen will also explain research showing that people tend to believe in conspiracy theories when they lack information and fill in the gaps by ‘projecting’ their own moral tendencies onto the alleged conspirators, and will discuss some of the features that make conspiracy theories persuasive vs. those that are less effective. Finally, she will talk about the beginning of a research programme examining some of the consequences of beliefs in conspiracy theories. For example, she has some data showing that exposure to conspiracy theories makes people feel less powerful and therefore less likely to want to vote. 2.00-3.10 David Aaronovitch, “Do conspiracy theories have common characteristics over time and space?” Details to follow. 3.10 Jamie Bartlett and Carl Miller, “Truth and the Net”. Jamie and Carl will talk about their forthcoming (August 2011) report ‘Truth and the Net’ which examines the extent that conspiracy theories and misinformation are entering the classroom; how far young people are equipped with the digital literacy required to confront them. This is based on a large national survey of teachers on the subject. They’ll sketch out the critical thinking skills, habits and knowledge young people need. David Aaronovitch, author of Voodoo Histories (further details to follow. Jamie Bartlett is the head of the Violence and Extremism Programme at the think tank Demos. He researches and writes about a wide variety of extremist groups. He recently authored a major paper on al-Qaeda terrorism, which included living alongside radical Islamists. He is currently leading a research team conducting the largest ever survey of the far-right in Europe. Robert Brotherton is a member of the Anomalistic Psychology Research Unit at Goldsmiths, University of London. He is conducting a PhD, funded by the ESRC, on the psychology of belief in conspiracy theories. He also teaches as part of the anomalistic psychology undergraduate module at Goldsmiths. Robert is currently acting as assistant editor of The Skeptic and convenes the Anomalistic Psychology Interest Group, a seminar group for academic discussion of topics within anomalistic psychology. Dr Karen Douglas is a Reader in Psychology at the University of Kent. She is Associate Editor of the European Journal of Social Psychology and Social Psychology. Karen is also a Fellow of the Society of Experimental Social Psychology and a member of learned societies in social psychology and communication studies. She has published widely on topics such as language and communication, the psychology of the Internet, feedback, and the social psychology of conspiracy theories, and her research has been funded by the Economic and Social Research Council, the Australian Research Council and the British Academy. She is the co-author of a forthcoming social psychology text to be published by Palgrave MacMillan and the first volume on feedback to be published by Peter Lang Publishers. Karen’s research on conspiracy theories focuses on the social psychological processes and consequences of beliefs in such theories, and the factors that make conspiracy theories so appealing. Professor Chris French is the Head of the Anomalistic Psychology Research Unit in the Psychology Department at Goldsmiths, University of London. He is a Fellow of the British Psychological Society and of the Committee for Skeptical Inquiry, as well as being a Distinguished Supporter of the British Humanist Association and a member of the Scientific and Professional Advisory Board of the British False Memory Society. He has published over 100 articles and chapters covering a wide range of topics within psychology. His main current area of research is the psychology of paranormal beliefs and anomalous experiences. He frequently appears on radio and television casting a sceptical eye over paranormal claims, as well as writing for the Guardian’s online science pages. For more than a decade, he edited of The Skeptic and his latest book, co-edited with Wendy Grossman, is Why Statues Weep: The Best of The Skeptic (London: The Philosophy Press). Carl Miller is an Associate at Demos and a researcher at King’s College London. He is interested in extremism, dissent, the Internet and social media. In 2010 Jamie and Carl authored The Power of Unreason, about the relationship between conspiracy theories and terrorist ideology. Following this paper, both spent months debating with 9/11 Truthers. Why boycott culture? Outcome of the debate. You can now download an audio recording of the Why boycott culture? debate at the South Bank Centre. “Here’s the very last point – tonight has been hugely revealing to me, because I thought my disagreement with the boycott movement was because I want to see the end of occupation, you want to see the end of occupation and it’s an argument about tactics. Hat tip: Alan A, Harry’s Place. On Thursday 14 July you are all invited to the opening of my show “Conversation Pieces: Scenes of Unfashionable Life”, a mini solo-show at the rear of the Baths Studios of Goldsmiths College as part of the MFA Fine Art Degree Show. It comprises of painting, sculpture, video and live performances all dealing with the Arab-Israeli conflict from my own Israeli point of view. Call it a Zionist show, call it what you like. If anyone would have told me two years ago, when I came to London to start my MA in Fine Art, that I would be making a show about the conflict, I would have laughed straight away. I had always thought of myself as a-political. I never thought I had an opinion about politics, right, wrong, I only knew one thing: that I didn’t know. That things were not as simple or clear-cut as a black and white painting and that there were so many other issues I could address as an artist. But then on my first day at Goldsmiths I was confronted by propaganda posters on the student union walls calling my country an “apartheid state”. It was the first time I had heard of it. Apartheid. How? In what way? I went to art school in Jerusalem with fellow Arab artists. We built our exhibitions together side by side, helping each other. I served in the Israeli army with Arabs and ate the same oily army food with them, and consoled myself with the same Arabic coffee that we brewed together in a small makeshift pot. My own army commander was Druze. All of a sudden I felt threatened and unwelcome here in Britain. I grew up in London from the age of five until I was seventeen but this was a very different London than the one I remembered so fondly. In the first year at Goldsmiths I lay low, I tried fitting in, I refused to make work about my Israeli identity or anything that had to do with it. But it was simply not good enough. Because I was constantly confronted with questions, accusations, labels. It would happen on the way back from a party or over a casual cup of coffee. I saw more posters and protests and boycotts slandering my home, the place that made me who I am, a place that was barely recognisable in those posters. I saw the crass misrepresentation of my region and its de-legitimisation on a daily basis and I felt powerless. I did not have the words, I did not have the flashy slogans and the fashionable labels. When I attended a meeting of the Palestine Twinning Campaign at Goldsmiths I felt like it was 1939 all over again. I was expecting a real dialogue but instead they were calling for academic boycotts of Israel, they were rallying young students who were desperate to be passionate about something to silence people like me; to silence artists and intellectuals who believe in human beings and mutual tolerance, who are the real hope for peace and for a bright future. I was horrified. What next? Would they start burning Israeli books? 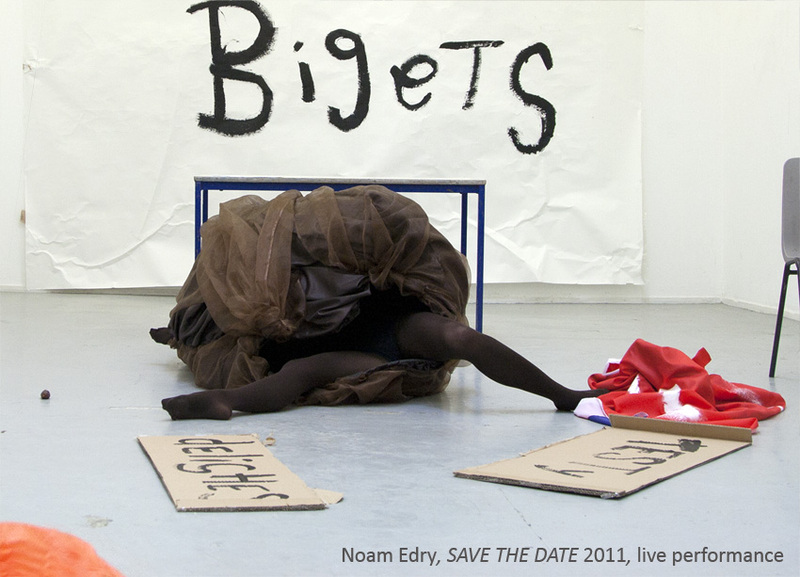 I promptly made the work “Save the Date” where I dressed up as a giant boycotted Israeli date and pleaded with my fellow artists to eat me. I performed it twice at Goldsmiths but the second performance was boycotted by the students. What utter absurdity, I thought: to boycott a performance about boycotting! Documentation of the performance “Save the Date” will be screened at my upcoming show opening this Thursday. 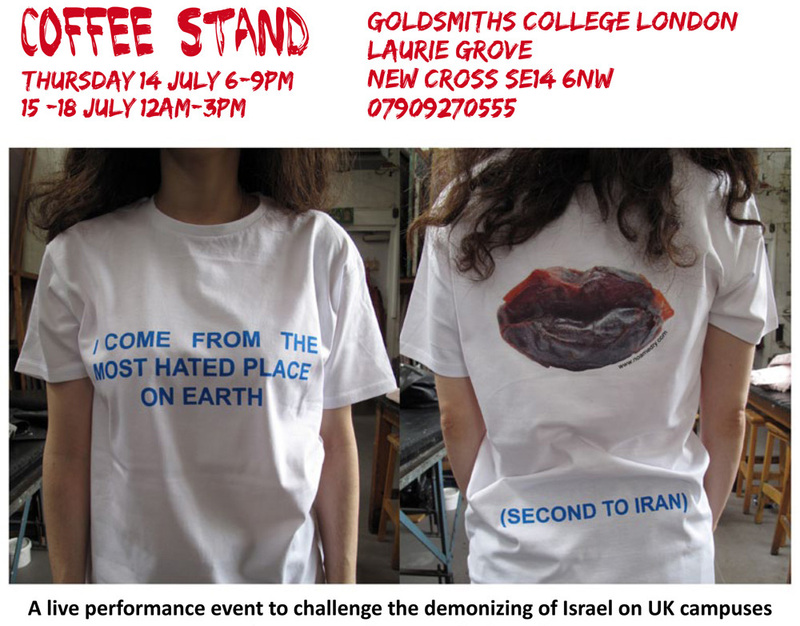 Also on show will be “Coffee Stand”, a work that challenges the demonising of Israel on UK campuses. The stand will be situated at the entrance to my show and manned by Israeli and Jewish volunteers, who will serve Arabic-Israeli coffee to members of the public. They will wear T-shirts designed and hand-printed by me with the text: “I come from the most hated place on earth” and on the back: “(second to Iran)”. Those who wish to take part by wearing a t-shirt at the show will be given one for keeps. You are all welcome to come and see it. There will also be a holistic therapist ready to rehabilitate your left side. Those who have tried it have felt the change. I hope to generate real dialogue here, a conversation over a friendly cup of coffee, to show the faces of those directly affected by the hate-campaign, the demonization and the de-humanisation. Because, after all, what does it mean to hate a country? What is a country if not its people? What does it mean to hate a person simply because of the place where he/she was born? What good does it do? I believe in human beings. I believe that each and every one of us seeks happiness. If people want to be passionate about a cause they should know what it is they are rallying for. And make sure they are not trampling on someone else in the process. Passion is good when it is channelled in positive ways. When tolerance and well-being is the real goal and not the adrenaline rush of a good fight. There is an Israeli voice in Goldsmiths. There is a Jewish voice in Goldsmiths. It is loud and it is here and it will not be silenced. Ian McEwan’s acceptance of the Jerusalem Prize raised a storm of protest. We debate the motion ‘Cultural boycott can be an effective, indeed morally imperative, political strategy’. Jonathan Freedland, a columnist for the Guardian, and author of six books including Jacob’s Gift.